Printed Circuit Board for Rheem/Ruud Furnaces RGEB, RGDE, UGEB and UGDE. Come see photos of this board Pt. # 47-22445-01 Replaces the following older numbers: 8404-5600, 8404-5593, 47-22445-02, 695-211, 82-03-756 and ICP 47-22445-01. 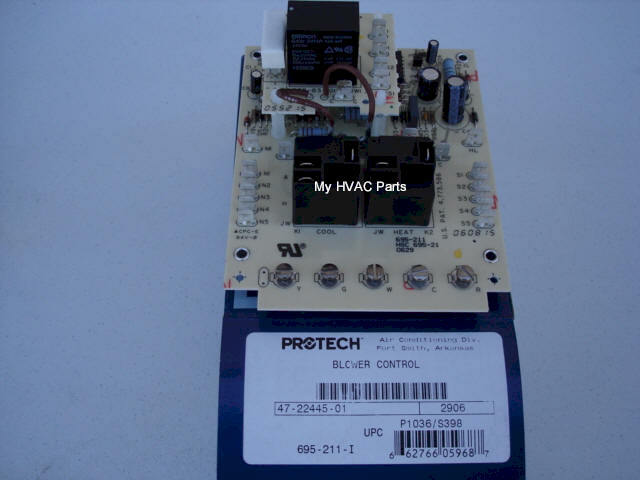 On the Rheem Model RGEB and Ruud Model UGEB this control board is only used on a date code ON OR BEFORE 1489. To find your date code please check your furnace serial number as follows for the date code. After the 'F' in the middle of the serial number, the next (4) digits is the date code. Do NOT use this control board on a date code AFTER 1489, but call us with your Model and Serial number so we can get you the correct board.